Update 4/4/17: Added Hugo recommendations, which are +2 to a story's score. Update 3/11/17: Added story links for Analog's Readers' Awards Finalists (5 novellas, 5 novelettes, 6 short stories). Update 3/3/17: Added Saturn Award Nominees link to Dramatic Presentation categories. Update 3/2/17: Added story links for Asimov's Readers' Awards Finalists (5 novellas, 5 novelettes, 5 short stories). 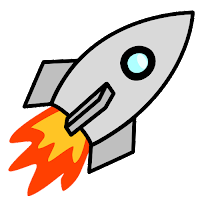 Update 2/20/17: Added Annotated 2016 Nebula Award Nominees link. Update 2/5/17: Updated RHorton's Novella & Novelette recommendations which were too long to fit into his year's best SF/F anthology. Update 2/1/17: Added Annotated 2016 Locus Reading List link. Update 1/28/17: Added 2017 Editors (Short Form) link. Update 1/16/17: Added 2017 Professional Artists link. The stories in each of these lists are grouped by a "recommendation score" from six prolific short-fiction reviewers, and each entry includes links to reviews. We also provide extensive information on how to buy or borrow digital copies of back issues of the print magazines. If you just want to read without regard to story length, see the Year-To-Date by Rating, Score, and Magazine pages. 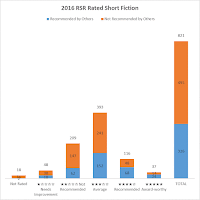 There are also the RSR-compilation of the "year's best" SF/F anthologies (96 stories), RSR-annotated versions of the 2016 Locus Recommended Reading List (12 novellas, 36 novelettes, 76 short stories) and 2016 Nebula Award Nominees (6 novellas, 6 novelettes, 7 short stories). 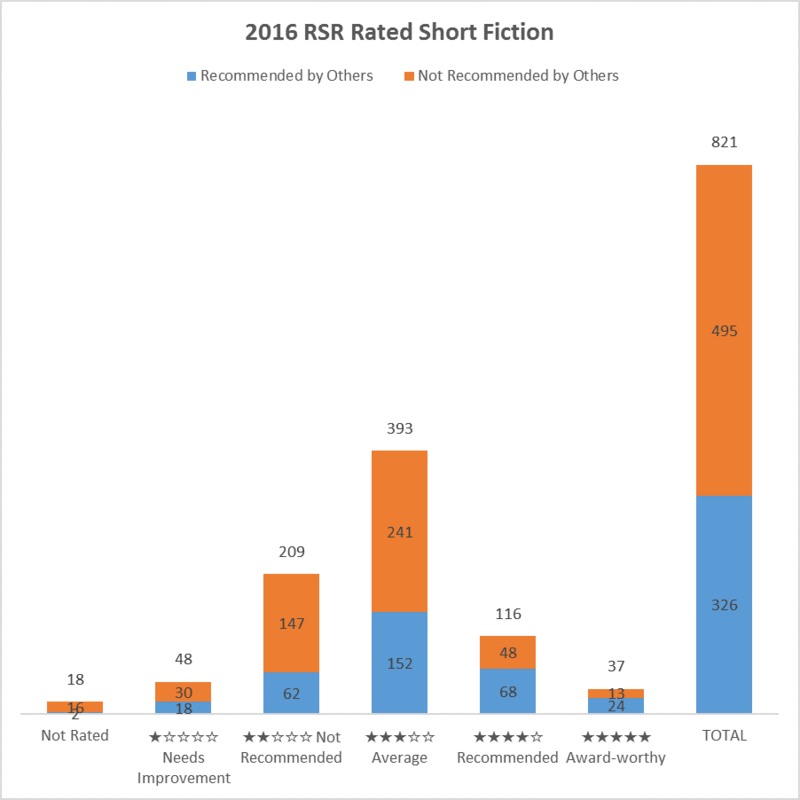 Here are links to lists of stories in every magazine and anthology reviewed by RSR in 2016. The stories are sorted by title and contain a brief description and category (novella, novelette, short story). To pick candidates for Best Professional Artist, you need to be able to look through a lot of full-sized images quickly, separating out the ones worth more study. Our 2017 Professional Artists post uses a "lightbox" display to let you scroll through the cover art from the major magazines and novels of 2016, and it includes links to the original publications and the artists' online galleries (where possible). With this system, you can riffle through about 200 pieces of cool art in just a few minutes. We are no longer doing a Fan Artists page due to the enormous size of the field. Fan art can be found by browsing eFanzines.com, looking at the art section of semi-prozines like Beneath Ceaseless Skies and Strange Horizons, and the sky's the limit at DeviantArt.com which gets over 140,000 submissions per day. Finally, to help people make nominations for the Best Editor (Short Form) category, we collected together all the statistics we could think of on our 2017 Editors (Short Form) page and we offer some suggestions on how to combine them to pick candidates. By the way, TV series also qualify for this category when an entire season is taken as a whole. George R.R. Martin notes "Game of Thrones" won it's first Hugo Award in this category for season one. 2017 Hugo Awards nominations have begun and continue through March 31. To nominate, you must have either been registered for MidAmeriCon II in 2016 or been registered for Worldcon 75 (or Worldcon 76) before January 31, 2017. Worldcon 75 will be held in Helsinki, Finland from August 9-13, 2017. Worldcon 76 will be in San Jose, California in 2018.